Be the first to share your favorite memory, photo or story of Irvin "Irv". This memorial page is dedicated for family, friends and future generations to celebrate the life of their loved one. Irvin "Irv" E. Henry, 94, of Syracuse, passed away Monday, February 4, 2019 at Upstate University Hospital Community Campus. Born to the late Irvin and Ruth (Wachob) Henry in Big Run, PA, he was raised in Johnsonburg, PA. He graduated from Johnsonburg High School, Clarion State College and received his master's degree from Cornell University. A Marine Corps veteran of WWII, Irv received a citation for his services with the battle of Saipan and Marianas Islands. He began his career in education in Newfield. 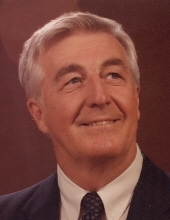 Irv was the superintendent of Groton School District, district superintendent of Tompkins-Seneca BOCES and district superintendent of Onondaga-Madison BOCES. He retired in 1984 and moved to Brevard, NC after his many years in education. A member of Immanuel United Methodist Church, Irv completed several mission trips with various churches, from A to Z, Alaska to Zimbabwe, and helped build houses through Habitat for Humanity while in North Carolina. He enjoyed golfing, gardening, hiking and trail maintenance in Brevard, NC. Above all, he loved spending time with family, especially his grandchildren. Irv was predeceased by his sisters, Betty, Louise, Mildred, Nellie and Shirley. Surviving are his wife of 69 years, the former Doris Hanson; son, David (Mari) of Dallas, TX; daughters, Becky Henry, Paula Brunelle, Barbara Henry and Carole Henry, all of Syracuse; grandchildren, Samantha (David) Warren and Shane (Ashley) Brunelle, both of Syracuse; and great-grandchildren, Carter, Clara and Ella Warren. Relatives and friends may call Sunday, February 10 from 2 to 3 p.m. at Immanuel United Methodist Church. Services will follow at 3 p.m. in the church. Burial will be in Onondaga County Veterans Memorial Cemetery. In lieu of flowers, contributions in Irvin's memory may be made to Immanuel United Methodist Church, 303 Kasson Rd., Camillus, NY 13031 or to one's favorite charity. To send flowers or a remembrance gift to the family of Irvin "Irv" E. Henry, please visit our Tribute Store. Immanuel United Methodist Church "Church of The Bells"
"Email Address" would like to share the life celebration of Irvin "Irv" E. Henry. Click on the "link" to go to share a favorite memory or leave a condolence message for the family.